When we think of the Jim Crow laws enacted in the South after the Civil War and Reconstruction, “colored only” toilets, water fountains, and seating at the back of the bus may come to mind. All dreadful strictures, but the deeper methods of oppression underlying those examples were systematized viciously. John Sayles’s new film, Honeydripper, hones in on this repression. The famed director who brought us the groundbreaking lesbian-themed Lianna has been a steadfast hetero white male friend and interpreter of minority concerns through such films as The Brother from Another Planet, Matewan, Passion Fish, and Lone Star. Until the National Voting Rights Act of 1965, spurred by the tireless activism of Martin Luther King Jr. and the Civil Rights Movement, African Americans widely were kept from voting, although they had the right to do so. Frequently, those who tried to vote met with white-inflicted injury or worse, often by terrorist group the Ku Klux Klan. Honeydripper is set just prior to this period, in 1950s Harmony, Alabama, where Jim Crow laws still actively institutionalized racism. The Honeydripper, a rural lounge with a black clientele, offers live jazz. Unfortunately, times are changing, and the establishment faces a new technological competition: the jukebox. Lounge owner “Pine Top” Purvis (Danny Glover), desperate to meet a critical deadline involving, in part, a payback for boosted liquor supplies, reaches a compromise of sorts by booking a live singer with an electric guitar (just the sort of black music that deeply influenced Elvis Presley). 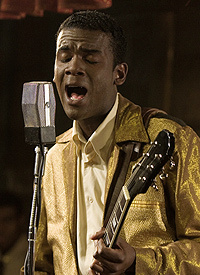 Pine Top sees Sonny (Gary Clark Jr.), a talented young black singer, as a solution to his dilemma. Unfortunately, Sonny is arrested arbitrarily by the sheriff (Stacy Keach), and jailed as a vagrant. During this period, 87 years after the Emancipation Proclamation, black vagrants still can be detained and farmed out indefinitely as cotton pickers. In the world of Honeydripper, all the characters treat others badly—white on black and black on black. Sayles’s actors splendidly mine the tension and mordant humor from that dynamic. Glover gives an inspiring performance as a basically decent man in late middle age adroitly and slyly braving the odds. 4814 Chicago Ave. S., Mpls.